There are few pieces of tackle more important or more debated among anglers than fishing line. Fishing Line comes in many strengths, colors, and forms, which can be applied in many different situations with varying degrees of success. To the new angler or the old salt used to throwing Zebco monofilament line exclusively, the options can be dizzying and can lead to poor investments being made. In this article, I plan to lay out a number of different types of line and inform you on which situations call for what. I’ll start with the most basic, yet hardest to grasp part, which is… in my humble opinion, color doesn’t matter (though here is a different take on the subject). I’ve thrown every color of mono and braid available in my region, and none of them attract more bites or spook more fish. A bright orange braid will catch the same fish as an invisible fluorocarbon, and that’s simply a fact. My preferred line to throw is metered braid manufactured by Sufix, which actually changes color every 25 meters. For me, I find it to be the best braided fishing line for spinning reels but it doesn’t really matter what color I use. The general rule is that line will break at 50% above the posted ratings. For an example, 10lb test will snap under 15lb of direct force under most conditions. Use this knowledge and apply it to your targeted species of fish. Four to 10 lb test would work exceptionally well for trout or bream but would be likely to snap under the head shaking fury of a largemouth bass. Ten – 20 lb is acceptable for all but the heftiest of lunkers but would fail quickly under the sprinting force of a bonita on the coast. Anything deep-sea related calls for a heftier line, with the standard being 50 lb test braid, a type of line we’ll get into a little more soon. Now, don’t get me wrong, you can catch a monster on a line thinner than dental floss, but the lower test rating of the line, the less forgiving it will be to poor technique. To land a fish hooked on an under-rated line, apply less pressure and lower your drag, allowing the fish to tire itself out and allow for easier landing. NEVER boat-flip a fish on under-rated line; it ends in heartbreak more often than not. Instead, reel the fish close to the water’s edge, grab the line with your free hand as close to the fish as possible, and lift the fish out in one smooth motion. Jerky motions apply undue stress to the terminal knot end of the line, often snapping it off mere inches away from you. 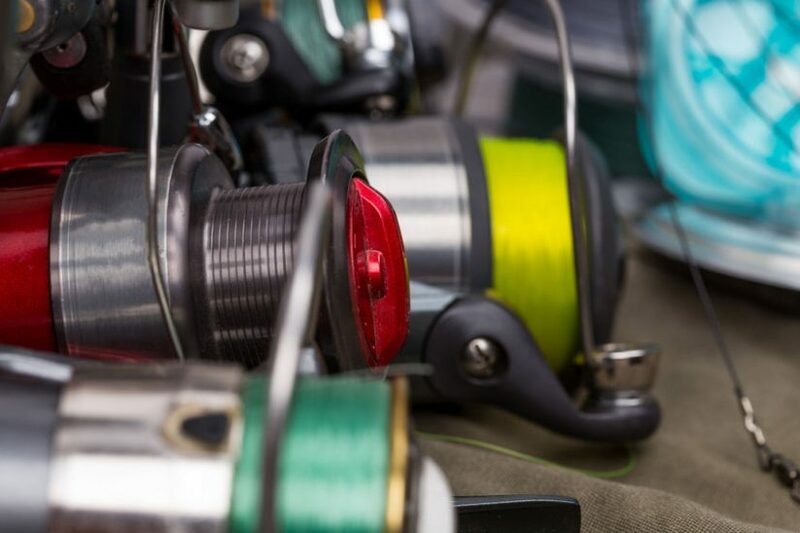 Now, tips and techniques aside, let’s take a more detailed look at the 3 common types of fishing line in use by sport fishermen today as well as each’s strengths and weaknesses. 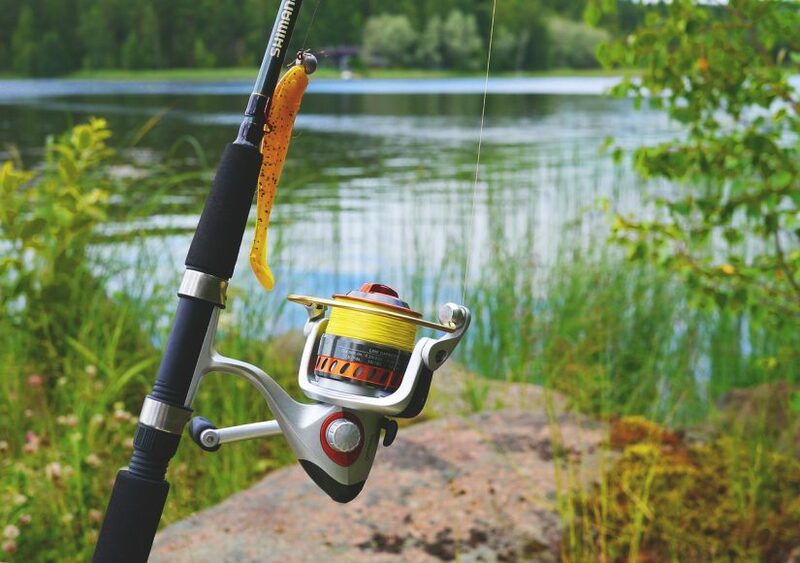 Fishing line, like any other piece of tackle, continues to evolve with new innovations every year, it seems. It can get confusing sometimes when looking at the vast array of products on the market. As manufacturers continue to tweak line technology in an effort to separate themselves from the completion or create new products among their own offerings, we see an unending stream of marketing cleverness online and on retail shelves advertised as “hybrid“, “copolymer“, “super lines”, “multifilament”, “microfilament” and so on. These lines are touted as being x-times stronger, more abrasion-resistant, and having better casting properties than the next fishing line. While some of these lines offer some improvements for certain angling situations with their special proprietary formulas, increased fiber count and “gel-spun” polyethylene construction, they are, in most cases, essentially a product based on one or more of the 3 fishing line types we’ll discuss here. Therefore, this article will only discuss the 3 major fishing line types: monofilament, braid, and fluorocarbon. One pet peeve, quickly, before we get started: the different styles of line are designed for different applications and environments, but rarely state their intentions on the package. I wish that line manufacturers would be clearer in this respect, but that is beyond the scope of this article, so on we move. Monofilament, or simply “mono”, is the most common and popular type of fishing line used today. But it wasn’t always that way. When Dupont invented nylon, the first synthetic fiber (amid an interesting backstory), just before the start of World War II it was seen, potentially, as an important advancement for the sport of fishing. However, it would not play out that way for another two decades. Though displaying exceptional knot strength and low visibility in the water, early monofilament line had a few major weaknesses with regards to its use for sportfishing. Unlike the mono we use today, the single-fiber nylon fishing lines of the time were too stiff and difficult to use for most fishing applications. It wasn’t until Dupont brought their Stren brand (now owned by Pure Fishing – also parent company of Berkley, Abu Garcia, and Penn) to market in 1958 that monofilament hit its stride. The new and improved line with its thinner diameter and flexible composition became a game changer for anglers worldwide and set the stage for the monofilaments lines we use today. Mono is great for topwater fishing and crankbait fishing as it has better stretch capability than other types of line, allowing the bait to swim more freely and erratically. But it is also a good line type for just about any style of fishing or presentation, and it shines with freshwater and saltwater use alike. Easy to Use: It is a good line for both beginner and experienced anglers because it is easy to work with. Stretch Factor: Mono is very forgiving of angler mistakes such as improper drag settings or very hard hooksets because of its stretch quality. Knot-Friendly: It makes tying different knots easier; also allows for the creation of strong knots. Inexpensive Cost: Monofilament is the most affordable line type of the three – great bang for the dollar. Lower Sensitivity: Mono lacks the real-time feel (unlike braid) because of its tendency to stretch, making it harder to detect very light bites. Replacement Rate: Monofilament is more susceptible to the elements, particular UV light, and saltwater, requiring more frequent change-outs. While many think of the braided fishing line as some high-tech creation of the last few years, the truth is they have been around for a long time – a lot longer than monofilament line. There is nothing new about weaving or twisting fibers together to create a stronger line – the practice goes as far back as the Bronze Age. What is new, however, are the materials used in creating modern braided fishing lines. Naturally produced materials have given way to newer synthetic fibers such as Spectra and Dyneema (Micro-Dyneema) that are much thinner and stronger. If you intend to fish a body of water abundant with structure and obstacles, braided line is the better option. Mostly used for heavy duty flipping and pitching into cover, or fishing topwater lures, braid line is comprised of multiple fibers intertwined to create a stronger, thinner line. I like to use braided line for bass fishing. My 15lb test metered braid has the same width as mono rated at only 6lbs, meaning that I can fit more braid on my reel than mono of the same strength, aiding in longer-distance casting needed for working a frog. However, braid can lend to sloppy technique with action-based baits such as spinners, crankbaits, swimbaits, and the like if you are not careful. In addition to extremely thin diameters and tensile strength as high as 15 times that of steel, today’s braided lines feature a host of advantages for the modern angler. But like anything else it also has a few drawbacks. Here’s a look at some of braid’s top pros and cons. Extreme Sensitivity: Braid lets you feel even the lightest bite for more hookups because of it zero-stretch quality. 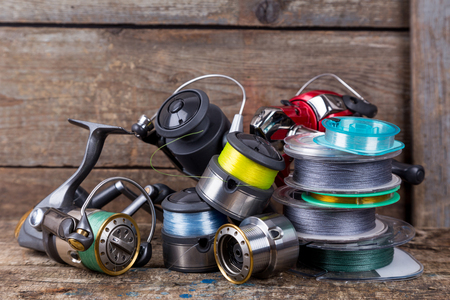 High Strength-to-Diameter Ratio: The line’s thin diameter and superior break strength mean you can pack more yards of heavier test line onto your reel. Better Buoyancy: It is naturally buoyant – braid floats; perfect for working topwater lures such as frogs, poppers, buzzbaits and the like. Reduced Knot Strength/Difficulty: Braid knots don’t hold as well as mono; tying certain knots can be a challenge – slipping is one issue (follow manufacturer’s guidelines). Higher Cost: Though braided line prices have dropped over the years, it can still cost 3 to 4 times more than comparable test/yards of monofilament. Most recreational fishermen are familiar with fluorocarbon line as leader material. But fluorocarbon can also be used to great advantage as a main line/full-spool line as well, providing its relatively high cost isn’t a deterrent to the angler. However, with full-spool fluorocarbon steadily becoming more affordable an increasing number of anglers are using it for more than just leader material. Fluoro has many qualities that make it the perfect line for various challenging situations. For instance, it has outstanding abrasion resistance, making it a good choice for fishing around structure or heavy cover. It is also a durable line that stands up to the damaging effects of saltwater and UV rays better than mono. But where Fluorocarbon really shines is in its ability to go almost undetected in water. Fluorocarbon has the same refractive index as water, rendering it functionally invisible under the water’s surface. This makes fluoro the go-to line for finesse fishing, such as working a jig through the clear waters of a still pond. It also allows for more stretch than braid, leading many to use it with crankbaits alongside a good monofilament fishing line. This can lead to missed hooksets, though, as the stretch lends to a slight delay in action between the rod motion and the actual hookset. Overall, however, it’s hard to beat fluorocarbon as a fishing line. Extremely Low Visibility: Fluorocarbon has many good qualities but its near invisibility in water is its strength. It is a must when fishing in clear water or for cautious species. Abrasion Resistance/Durability: It is a good line for fishing around structure or abrasive bottoms; also good for prolonged use in harsh environments/conditions. Good Sensitivity: Because the line’s density and low-stretch quality, it transmits any activity on the other end of the line faster and allows for stronger hooksets. Sinking Ability: The line’s density/weight make it perfect for weightless presentations or quickly getting your baits, crankbaits, soft plastics and jigs to the bottom. Shock Strength: Because of Fluoro’s low stretch, it doesn’t absorb shocks or sudden, hard hits/ hooksets as well as mono and can result in missed opportunities. Knot Tying/Strength: Fluorocarbon’s density makes it somewhat stiffer than other lines, making tying knots more difficult and slipping/breaking knots a potential problem. When push comes to shove, each type of line shines under different situations, and each strength has its place in angling. I’d recommend that you plan your next outing accordingly, and go with the line type most suited to your environment and prey. Doing so can definitely help you in your quest for the big one. This entry was posted in Fishing Tips & Other Wonderings, Tackle/Gear Reviews & Guides on July 14, 2018 by Willie Luker. I’ve used monofilament line my entire life but I recently moved and most of my favorite fishing spots in the area are loaded with obstacles. I’m going to try braided line this season. I was worried about the visibility but I think I need the added strength. Hi, Skip. I say go for it. Use a quality braid and you won’t go wrong! The saying “the right tool for the right job” applies for anglers too as this article shows. I’ve always erred on the side of caution when it comes to choosing fishing line, going with line above the posted ratings for the fish I’m hoping to catch. That’s always a safe bet, for sure. The only time I feel that it’s not true, is in clear water situations. The clearer the water, the more of a need to downsize your line accordingly. Good luck!